At least, I know that, except for the chocolate (dark but industrially-made) there is nothing industrial about this cake as opposed to the ingredients listed on the Brossard website... . so if my husband can enjoy my gâteau marbré, Brossard might not make money off me for a while... I'll keep my memories intact instead! Bon Appétit! Preheat oven to 165C (330F). Put the butter in the oven as it warms up to melt the butter. Make sure not to let it burn! In one bowl, mix in half the flour and half baking powder together. In a large mixing bowl, beat the eggs with half of the sugar until light and fluffy. Pour about 2/3 of the Vanilla batter in the mold. Bake in the oven for 45 minutes or until a knife comes out clean. 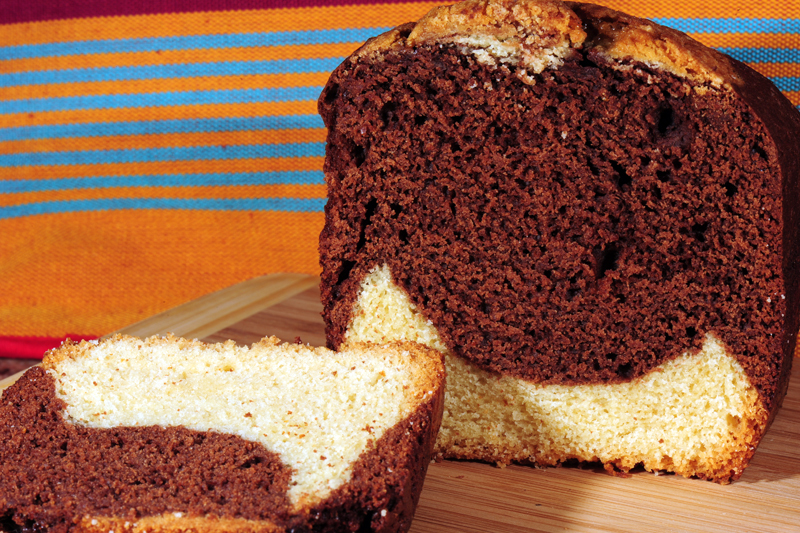 You could add a few cocao nibs (or chocolate chips) to add a little bit of crunchyness to this cake. There was once a Food Pyramid, then came My plate... together with the "you have to eat at least 5 servings of fruits or vegetable servings a day"... and all of that did not really make any sense to me (how big is a serving (I know, I know it's defined but it's really hard to remember, no?) I knew what the underlying recommendations were... but when it came to implement them on a daily basis, then I was a little bit confused. The new My Plate that the U.S Department of Agriculture came up with a few months ago was supposed to make things easier for people to understand. While I it was a little bit less confusing than the Pyramid, it did not give people a simple way to improve their diet. White buns and hot dogs and fries would qualify on My Plate while we all know that this would not qualify as as "healthy meal" by dieticians' objective eyes!! The way I use it is to visualize how much of what I serve to my children (and to myself). My only problem is that being French, we tend to serve dishes in sequences (yes, that would be the three-or-four-course meal)... so it's not easy for me to visualize the proportion of the different types of food I serve and their relative "volume". Maybe I should go back to the cafeteria trays we used back when I was in junior high and high-school??? My advice to steadily serve meals that fit on that Harvard Healthy plate? 4) Talk about it with your children... this is a good way to get them acquire a good healthy diet! And it will give you a good excuse to limit sugar-loaded juices and to offer yet another serving of kale!! 5) Keep faith that your children will indeed enjoy Kale with wholegrain rice one day (I am still working on that one!!). 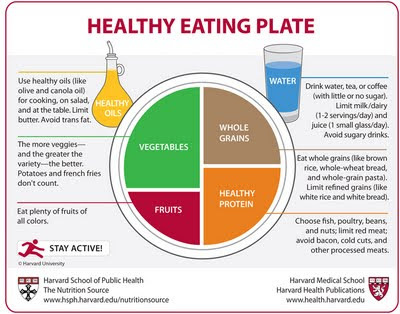 PS: You can read more about the Healthy Plate on the Harvard Health website.